In this season of thankfulness, I just want to let you, our precious customers, our friends, know that I am extremely thankful for you! You make my job enjoyable! And, as you plan your post-Thanksgiving shopping, I want to encourage you to “Shop Small” this Saturday, November 24th. Please consider purchasing gifts for the loved ones on your “Nice” list from local, small businesses, rather than from chain stores. In doing so, not only will you be giving unique items that are not cookie-cutter clones available just everywhere, but you will also be re-investing your hard-earned dollars back into the local community. 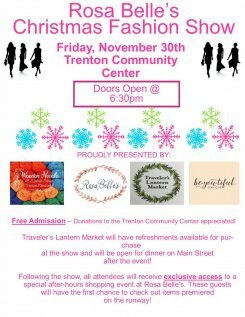 Trenton’s exciting “Open House” weekend and events, in addition to our next bi-weekly sale will hopefully entice you to find your way to Trenton over the next few weeks! Please read below for all the details! GIFT ITEMS 30% OFF(Find the sale items on our gifts displays near the front of the store.) 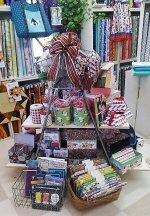 Choose from a wide variety of gifts and gadgets and gizmos sure to please the quilter on your gift list. With such a selection, you will definitely find something to fit your budget. CHRISTMAS KITS 25% OFF. Any kit located in our Holiday Room is included in this special offer. Come in and fill out your Wish List for Christmas, Birthday or just because..
Let your family and friends know we have it so we can help them shop. Rosa Belle’s Christmas Fashion Show, Nov. 30th at 7:00 pm. Saturday, December 1stis Trenton’s Open House. The participating businesses will be offering special deals, special drawings, and special refreshments to welcome our guests! Here at Quilt and Sew, you will have an opportunity to enter a special drawing for a $50 gift certificate. With each purchase made on December 1st, you will put your name in for a chance to win the certificate. You do not need to be present to win, but your purchase must be made in person on that day. In addition, all in stock patterns (excluding clearance items) will be 15% off, that day only! 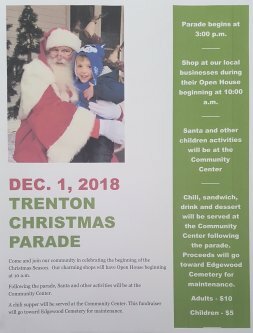 Trenton Christmas Parade, December 1st at 3:00 pm. We have it on good authority that Santa is coming to Trenton. He will be arriving during the parade and will join up with children at the Trenton Community Center, where there will be fun activities for children of all ages. Chili, sandwich, drink and dessert will be served, with proceeds going to the Edgewood cemetery maintenance fund. $10 adults, $5 children. Watch your inbox for another newsletter next week detailing our upcoming classes, including a new round of Quilting 101, and another year of Tucker University, including an evening class option, and another exciting class taught by Kathy Stuard! We also will reveal details about an exciting new program that we will be kicking off in December! Lots of fun stuff in store! !